Dividends are declared by the Board of Directors and paid quarterly on the members average daily balance. Minimum average daily balance required to earn dividends is $300.00 on the prime share. Share accounts are Federally Insured by NCUA up to $250,000. All contractors that have signed an agreement with IBEW Local 26 participate in payroll deductions (PDF-new window/tab). 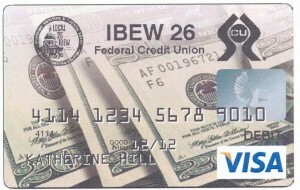 For convenience, IBEW Local 26 Union dues can be paid out of the member’s share account. To do so, call the Credit Union office and provide us with your account number and the amount of dues owed to the union and we will forward your payment to the dues office. In order to withdraw money, members can either mail or fax a signed written request for withdrawal of funds or come to the credit union in person. Share draft checking accounts are available. Review our monthly fee schedule. Our share draft accounts also have overdraft protection! Specially designed share drafts (checks) with union logo are available. With a share draft account, you can use your free VISA Debit Card for your everyday transactions. You can also pay your bills with our Online Bill Payer through your Online Banking Account (new window/tab) and never have to mail a payment ever again! Share accounts that are federally insured by NCUA up to $250,000. Open Sub-Share Accounts for Holidays, Vacations, or something special you want to save for! We offer Roth IRAs, Traditional IRAs, and Coverdell Education Savings Accounts (ESA). The fee to open an IRA is $25.00 and requires a minimum deposit of $300.00. IRAs also earn dividends quarterly. You will need a special application that is available at the Credit Union office in order to open one. IRA share accounts are federally insured by NCUA for up to $250,000. For member’s with current Share Certificates, please review the Truth-in-Savings Disclosure for withdrawal penalties and other information. Get more information on our latest rates for our Share Certificates. Get more information on our latest rates for our money market savings account.